Detention warrants have been issued for one current and 78 former staff members of the Finance Ministry as part of an investigation into Turkey’s Gülen group, the Hürriyet daily reported. According to the report the police have so far detained 24 of 79 suspects during operations in 26 provinces. The warrants were issued by the Ankara Chief Public Prosecutor’s Office on Thursday. 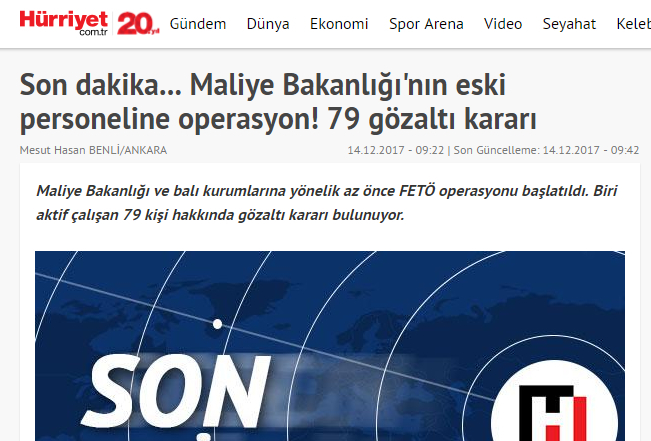 Seventy-eight of 79 staff members were dismissed by the government following a failed coup attempt last July. Interior Minister Süleyman Soylu said on Dec. 12 that 55,665 people had been jailed and 234,419 passports revoked as part of investigations into the Gülen movement since the failed coup attempt on July 15, 2016. Soylu on Nov. 16 had said 48,739 people had been jailed and eight holdings and 1,020 companies seized as part of operations against the movement.